This motherboard supports the latest Intel® Lynnfield/Clarkdale processors in LGA1156 package which has memory and PCI Express controller integrated to support 2-channel (4 DIMMs) DDR3 memory and 16 PCI Express 2.0 lanes providing great graphics performance. Intel® Lynnfield/Clarkdale processor is one of the most powerful and energy efficient CPU in the world. P7P55D-E Premium brings you the multi-GPU choice of either SLI™ or CrossFireX. The motherboard features the most powerful Intel P55 platform to optimize PCIe allocation in multiple GPU configurations. Expect a brand-new gaming style you’ve never experienced before! The motherboard supports DDR3 memory that features data transfer rates of 2200(O.C.) / 1600 /1333 / 1066 MHz to meet the higher bandwidth requirements of the latest 3D graphics, multimedia, and Internet applications. The dual-channel DDR3 architecture enlarges the bandwidth of your system memory to boost system performance. Supporting next-generation Serial ATA (SATA) storage interface with onboard Marvell® controller, this motherboard delivers up to 6.0Gbps data transfer rates. Additionally, get enhanced scalability, faster data retrieval, double the bandwidth of current bus systems. Experience ultra-fast data transfers at 4.8Gbps with USB 3.0–the latest connectivity standard. Built to connect easily with next-generation components and peripherals, USB 3.0 transfers data 10X faster and is also backward compatible with USB 2.0 components. 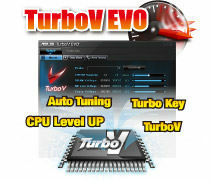 Whether novice or enthusiast, TurboV EVO satisfies overclockers of any level. Intelligently push systems to the fastest, stable clock speeds with Auto-Tuning. 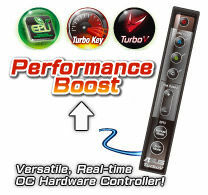 Turbo Key boosts performance with a simple touch, while TurboV offers additional advanced options for breaking those records! 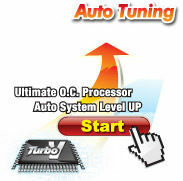 Achieve extreme yet stable overclocking results automatically with Auto Tuning! With built-in stability testing, Auto Tuning lets even beginners improve performance with no additional cost. Tweak your settings real-time without interrupting ongoing work or games. With ASUS TurboV Remote, you can overclock, activate Turbo Key and adjust EPU settings directly form a convenient side controller. Ever wish that you could have a more expansive CPU? 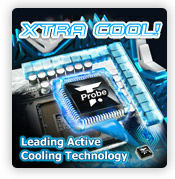 Upgrade your CPU at no additional cost with CPU Level Up! Simply pick the processor you wanted to OC to, and the motherboard will do the rest! See the new CPU speed and enjoy that performance instantly. Overclocking is never as easy as this. The groundbreaking 32+3 phase VRM design is brought to the ASUS motherboards. 32+3 phase power design, 32-phase for vCore and extra 3-phase for Memory controller inside CPU, can provide the highest power efficiency, and hence generates less heat to effectively enhance the overclocking capability. With the high quality power components such as low RDS (on) MOSFETs, Ferrite core chokes with lower hysteresis loss and 100% Japan-made high quality conductive polymer capacitors, ASUS 32+3 phase VRM design also ensure longer component life and minimum power loss.